TORONTO, Nov. 28, 2018 /CNW/ - Minto Communities Canada ("Minto Communities") in partnership with Metropia, is thrilled to announce the closing of the 1000th home at Kingmeadow – a sold-out, award- winning, master planned community in Oshawa. To celebrate this significant milestone, the team welcomed the homebuyer for a toast to thank and congratulate her family on their new home – one of 60,000 homes built in the company's 62 year history. 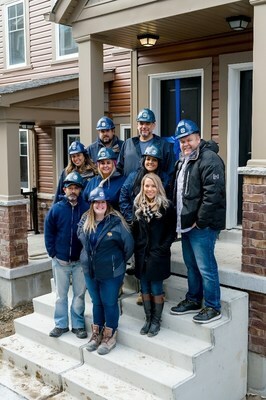 "There's a great sense of pride in handing over the keys to our 1000th homebuyer," says Troy Dosman, Vice President, Construction Operations, Minto Communities. "It's an occasion that brought our land development, construction, MasterCare and customer experience teams together as we round out this fifth and final phase at Kingmeadow – the Berkshire Abbey stacked townhomes." Launched for sale in 2012 with construction underway in 2013, the community is comprised of 1074 craftsman-style stacked condominium townhomes, back-to-back townhomes, traditional townhomes and single-family homes on 36' and 43' lots. Surrounded by green-space, parks, ponds and nature trails, Kingmeadow provides value to homebuyers from an investment and lifestyle point of view. Located just south of the newly extended Highway 407 and a short drive from Highway 401, it's within close proximity to shopping amenities, education and medical facilities. Kingmeadow has been recognized for a number of awards by the Ontario Home Builders Association (OHBA) and the Building Industry and Land Development Association (BILD). It's also a two-time winner of the Durham Region Home Builders' Association 'Community of the Year' award. Additional communities under development in the Greater Toronto Area include Ivy Ridge in Whitby and Glen Agar in Etobicoke, along with Minto Westside and Minto Yorkville Park in downtown Toronto. Minto Communities Canada, a division of The Minto Group, is one of the premier real estate companies in Canada with a fully integrated real estate investment, development and management platform, established in 1955. 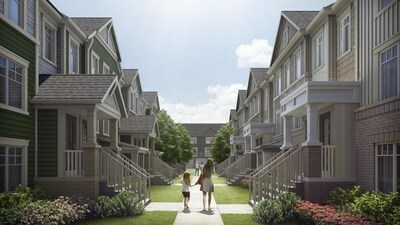 Minto Communities has built more than 85,000 new homes, and is well recognized by the Canadian real estate industry as four-time winner of Building Industry and Land Development Association's Green Builder of the Year, four-time winner of EnerQuality's Ontario Green Builder of the Year award and two-time winner of the Ontario Home Builder Association's Home Builder of the Year award.